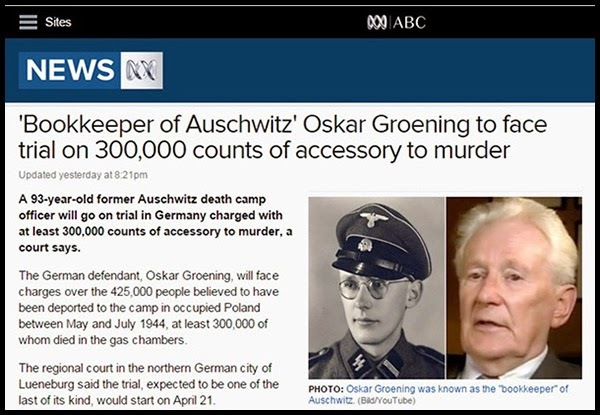 The BBC’s breathless coverage of Groening’s court date, as contained in their article of February 2, 2015, titled “Trialdate set for 'Auschwitz bookkeeper' Groening” is clearly designed to be an attempt to beat back the growing Holocaust revisionist tide. “Groening, who began work at Auschwitz aged 21, does not deny witnessing the mass killing at Auschwitz. 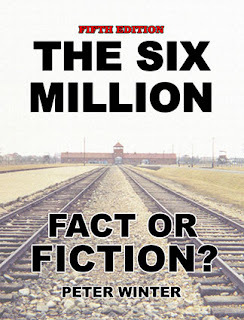 In 2005 he told the BBC: "I saw the gas chambers. I saw the crematoria. I saw the open fires. I was on the ramp when the selections [for the gas chambers] took place. "I would like you to believe these atrocities happened—because I was there." The documentary to which this article refers is the six-episode “Auschwitz: The Nazis and 'The Final Solution'” produced by the BBC and distributed all over the world. As usual with these sorts of Holocaust stories, the truth is very far from reality. This is a complete fiction, a made-up insertion. This overt lie was first pointed out by an alert viewer of the program from Portugal, one A. S. Marques, in a letter to historian David Irving, which was published on the latter’s website. 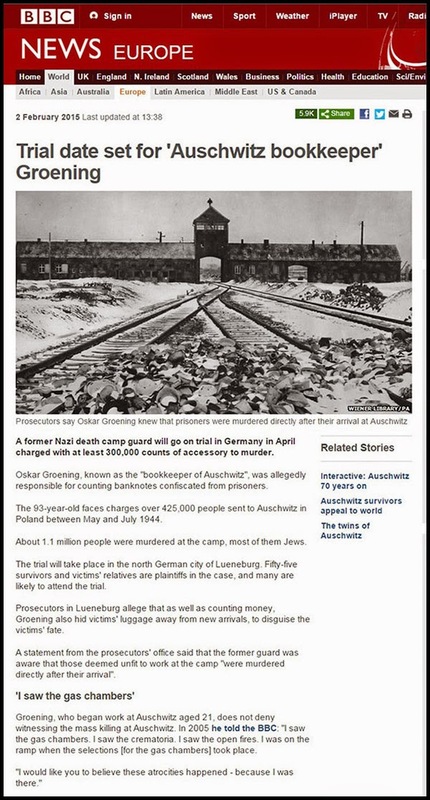 A. S. Marques of Portugal has spotted, Saturday, April 16, 2005, how BBC producer Laurence Rees faked what a German "eye-witness of gas chambers" actually said. "The fear that deniers could gain the upper hand led an SS camp guard, Oskar Gröning, to break a lifetime of silence earlier this year in a BBC documentary, Auschwitz: The Nazis and the Final Solution. ‘I saw the gas chambers. I saw the crematoria. I saw the open fires. I was on the ramp when the selections [for the gas chambers] took place,' said Mr Gröning, now in his 80s. 'I would like you to believe these atrocities happened— because I was there.'" Mr. Berg's quote is intriguing. I happen to have not only watched, but also tape-recorded, the BBC documentary he mentions, when it was broadcast last March 8  on the Portuguese channel RTP-2, in its original English version subtitled in Portuguese, and I was struck by the contradiction between the subtitles and the actual words one can hear in the film. They differ in one important detail from what one can distinctly hear, both in the German words spoken by Gröning and their superposed English translation. "I see it as my task, now at my age, to face up to these things that I experienced and to oppose the Holocaust deniers who claim that Auschwitz never happened. And that's why I am here today. Because I want to tell those deniers: I have seen the gas chambers, I have seen the crematoria, I have seen the burning pits—and I want you to believe me that these atrocities happened. I was there." "I see it as my task, now at my age, to face up to these things that I experienced and to oppose the Holocaust deniers who claim that Auschwitz never happened. And that's why I am here today. Because I want to tell those deniers: I have seen the crematoria, I have seen the burning pits—and I want you to believe me that these atrocities happened. I was there." Once again, we have a classic case of outright lies, combined with a “don’t-deny-it-happened-but-I-was-not-involved” type confession, the sort of which I detailed in Chapter 8: The Psychology of Confessions in The Six Million: Fact or Fiction. Critically, Groening talked about his time at the camp, but denies ever having committed any murders or atrocities himself. Equally critically, he would of course have seen crematoria, and cremations—these were installations at every single German concentration camp. The existence of crematoria does not, however, “prove” a mass extermination program, and it is clear that Groening was talked into making his remarks in some type of belief that he would not be prosecuted if he admitted being at the camp. Now, however, he will soon regret having been willing to comment at all, because his appearance on the BBC documentary, and his resultant “fame” has landed him in court facing no less than 300,000 murder charges. The only logical—and best—defense against this incredible charge, is of course to show that there were no mass exterminations. However, unfortunately for Groening—and he has played along with the game, never thinking it would land him in court—this obvious, and only, real defense is illegal in Germany. Groening now has talked himself into a serious court case, in which his only real defense is against the law. He will have little alternative except to accept that there was a mass extermination program, but claim that he had nothing to do with it.